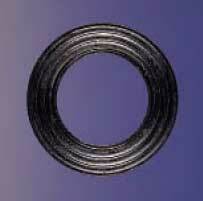 Thin sheet metal gaskets with pressed corrugations – usually concentric around the bore. • Surface configuration enables the gasket to adapt to irregular flanges without undue compressive load. • Provide efficient seal under varying conditions of temperature and pressure. Usually formed from 0.25mm thick brass, but virtually any malleable material will be considered. In material to suit the application, and to any practical shape, size and quantity.